I'm pretty much done with hearing about all the garbage surrounding the CBA. I just don't care anymore about who's winning which battle and what the negotiating points are. 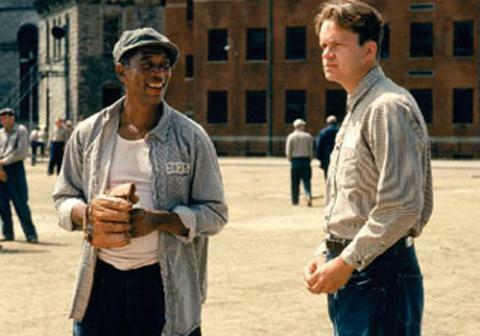 Much like the men in the movie The Shawshank Redemption, sometimes one just needs to forget about this prison that the NHL and NHLPA have trapped the fans in and find some hope. After all, the movie's tagline taught us one thing: "Fear can hold you prisoner. Hope can set you free." So let's set ourselves free from the idiocy of today's NHL-NHLPA fight by looking back on some jerseys and documents from the past as well as some interesting uniforms from today! We'll start in Anaheim as we fondly remember these one-year three-year non-committal alternate uniforms worn from 2003-06. They are about as bland as one can get when designing a uniform, and really offer nothing that could help or enhance the Mighty Ducks' image in terms of their overall look. Not sure who designed these, but I was never a fan of them. Although I suppose that it could have been worse. That's Michael Eisner, former CEO of Disney, who at one point owned the Anaheim franchise. If you want to see some interesting logos, here are some of the logos that were proposed at the time that the Mighty Ducks came into being. I'm actually glad none of those made the cut. I happen to love hockey history, so when I saw this New York Americans sweater worn by Art Chapman I was immediately taken with its beauty. I love the arched stars above the logo and number, and the cut of the sweater looks perfect for outdoor hockey as well! Absolutely gorgeous! Not to beat a dead horse about this lockout, but remember when Gretzky and his pals played a pile of European teams in 1995 when the league was on strike? The Ninety-Nine squad headed overseas to play European teams for charity, and Gretzky brought along a pile of his friends - Brett Hull, Luc Robitaille, Kelly Hrudey, Mark Messier, and others - to represent his team. They wore these uniforms while playing together which have a timeless feel to them. Not a huge fan of the LA Gear patch or the Time Warner patch on the shoulders, but I didn't make that call. Russian star Helmut Balderis was an interesting fellow in terms of his hockey career. He was a star in the Russian SuperLeague for many years with CSKA Moscow and Dynamo Riga from 1977-1985 before arriving in North America for one season with the Minnesota North Stars in 1989-90. So what happened between his time in Russia and North America? Balderis was playing in Japan! Interesting to see how the Original Six teams were a major influence in Japan in the 1980s with these uniforms! Canada has always used the red and white colors when playing in international tournaments, but they have worked a third color in in certain years. 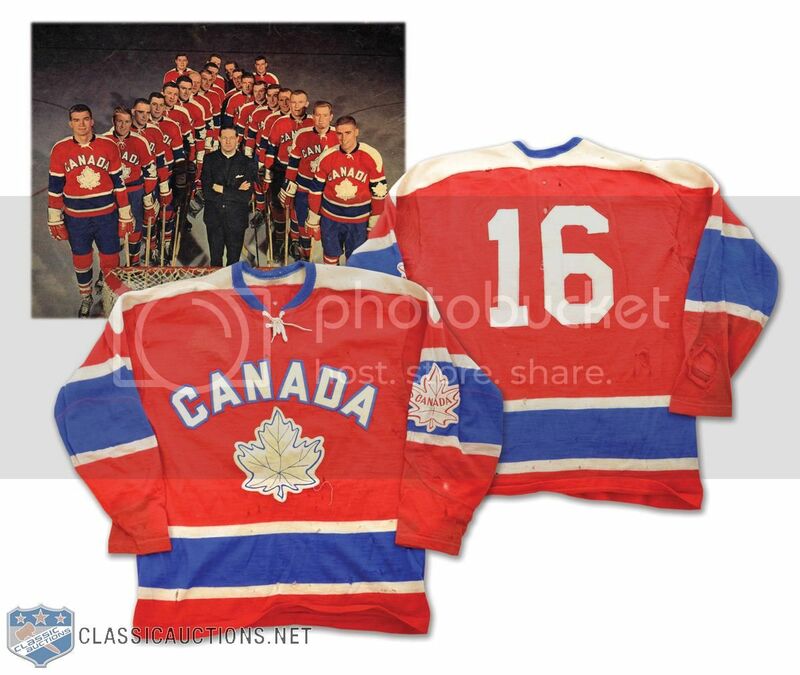 Take Terry Clancy's Canadian Olympic road uniform from 1964. Who knew that Canada was red, white, and BLUE? Canada didn't just wear a red uniform at the 1964 Olympics. They also brought along white sweaters, but they ran into a common laundry problem. Remember how you were told by your parents or guardians never to wash red socks with white shirts? 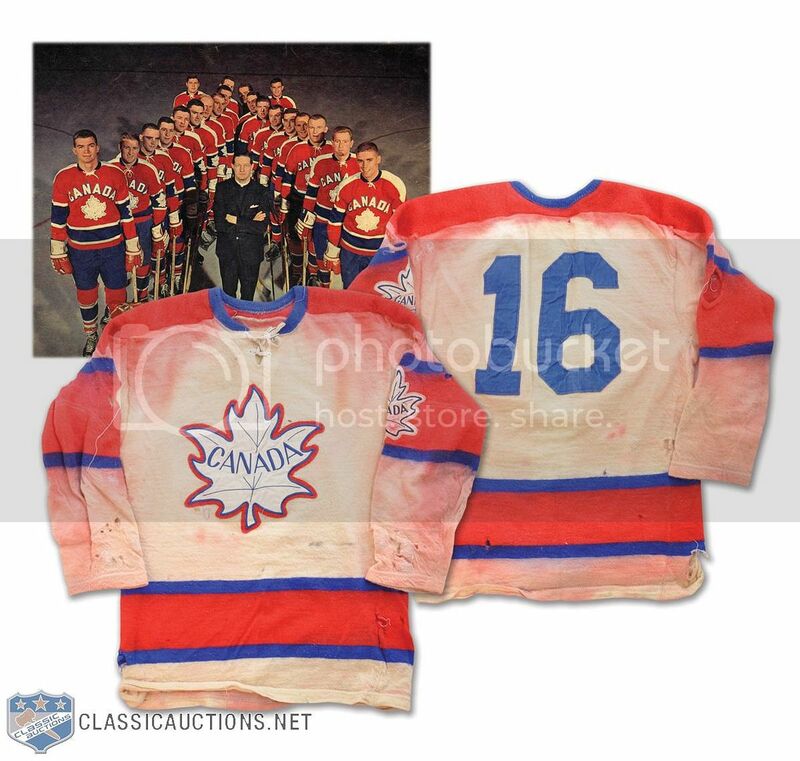 Yeah, the '64 Canadian Olympic team ran into the bleeding problem from their red accents on their white sweaters. Canada is now known for red, white, blue and PINK colors! Clear the track for Eddie Shack! If you notice on that Leafs uniform, the numbers are seemingly way up on the back of the jersey! Shack played before names were mandatory, and everyone seemed to wear his number between his shoulder blades rather than further down. I'm not saying that adding names was bad, but those numbers look way off being that high up on Shack's jersey. The WHA had a number of excellent logos and color schemes, and I have always been a fan of the Michigan Stags for their excellent logo. 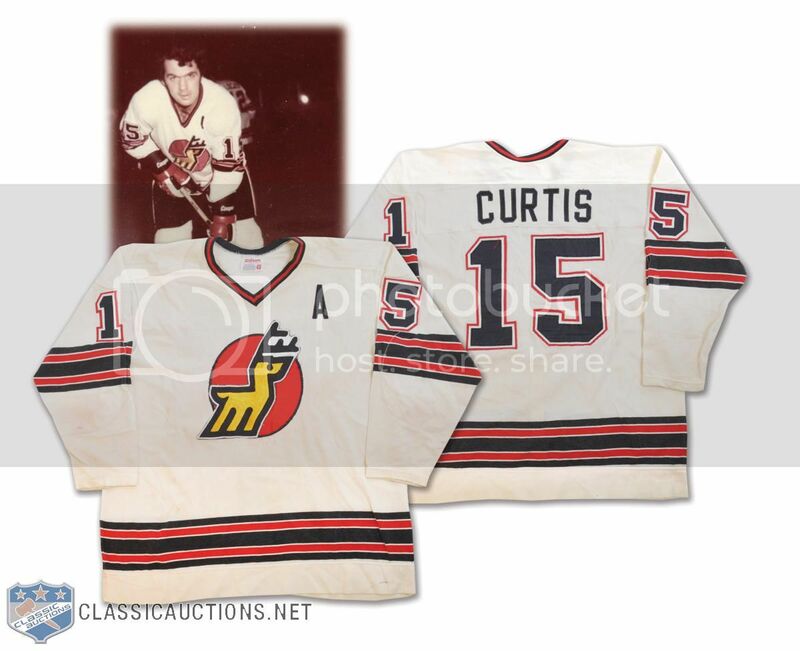 Here is Paul Curtis' uniform from the 1974-75 season in the Stags' short history. I can see the "M" for Michigan in the three legs of the deer, but I've always wondered why the antlers were drawn as they were. Anyone have any information on why they appear as they do? I spent some time looking at the Montreal Canadiens uniforms on the Classic Auctions website, and came across two names that I didn't recognize. As far as I can speculate and check the web, it appears that Mr. Waldbillig is possibly Dave Waldbillig who played for Notre Dame in the NCAA. In 1985-86, he had 14 goals and eight assists in 34 games as a winger, and finished his career in the NCAA with 20 goals and ten assists in 56 games. He did wear #20 at Notre Dame, so wearing #26 for the Canadiens in a preseason game or two seems plausible. If anyone has any additional info, I'm all ears! Looking at the other name, Mr. Takagi seems to be more of a mystery, but it appears to be Kunio Takagi, a defenceman who played at the University of British Columbia in 1985-86 where he scored three goals and added five helpers in 28 games. It appears that he may have played his entire hockey career for Kokudo in the Japan Ice Hockey League before retiring in 2000. If we judge the age of this picture based on the Starter logo on the uniform, we're looking at a period of time around the mid-1990s. That would put Mr. Takagi in his early-to-mid-30s if this is his uniform. Again, if you know more about this player, please let me know! Not to set off a firestorm in Montreal, but there was a Lecavalier jersey made up in 1996 by the Canadiens! Unfortunately, it was not for Vincent Lecavalier, but for René Lecavalier, the long-time play-by-play radio guy for the Habs! They gave Lecavalier this jersey with his name on it at the closing of the Montreal Forum in honour of the years of service he provided the club. A classy gesture by a classy organization! This past December, the University of New Brunswick Varsity Red men's hockey team hosted a team from Russia in the 8th annual Pete Kelly Cup Challenge! This year, in honour of the 40th anniversary of the Summit Series, UNB decided to wear the names of the men who took part in the game 40 years ago on their special jerseys for the occasion! 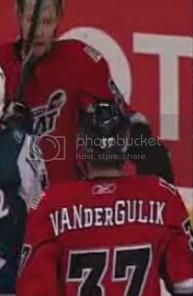 As pictured, V-Reds captain Chris Culligan, who wears #57 in his UNB uniform, donned Phil Esposito's #7 with Esposito's name on the bottom of the jersey for the two games against Team Russia. So how did the final product look? Not bad at all, I'd say. UNB won both games against the Russian team in the Challenge Cup as well to win the Pete Kelly Cup on New Year's Eve! Well done, gentlemen, and pretty cool jerseys! 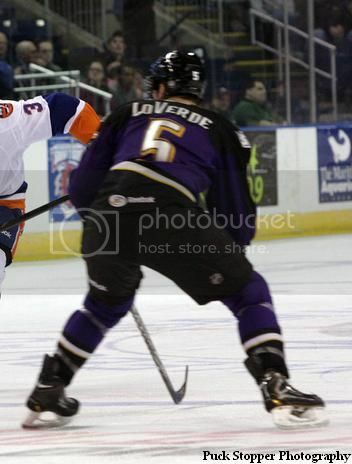 I was alerted of the next interesting jersey quirk by reader Mike E. Mike had attended a Manchester Monarchs game where he spied Vincent LoVerde with an interesting nameplate. LoVerde actually has the "L" and "V" in normal-sized Monarchs font, but the rest of his name is done in smaller capitalized letters! 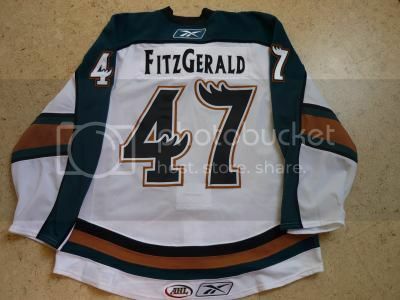 It immediately brought back memories of Zach FitzGerald's time with the Manitoba Moose and David Van Der Gulik's time with Abbotsford. I'm not sure what it is about the AHL, but they seem to very obsessive-compulsive about player names! And finally, we end with a document. It's not that this document is anything outrageous, but I found the contents of the document rather funny. Art Ross had a document made up for Ron "Peaches" Lyons on November 27, 1931 that is basically a termination notice! Perhaps they didn't have pink slips at that time, but Ross' letter states, "This letter is to notify you that your services are no longer required by this organization, and you are now a free agent." Lyons had played with the Philadelphia Quakers in 1929-30 before joining the Bruins for the 1930-31 season. The part that made me chuckle? This was dated at the start of the 1931 season, meaning he was given this letter while as a member of the Boston Bruin Cubs, Boston's "farm team" in the CAHL! Essentially, Art Ross was cutting him loose after demoting him already! After 17 games and five playoff games in the Bruins organization and one goal to show for it, Lyons was seemingly fired by Ross! Talk about interesting times back then! Hopefully I've kept you distracted with these jerseys and interesting info so that you aren't picking at the festering wound known as the NHL. Who knows if they'll be back this season? What I do know, though, is that hockey's history is pretty amazing when given a chance to shine!